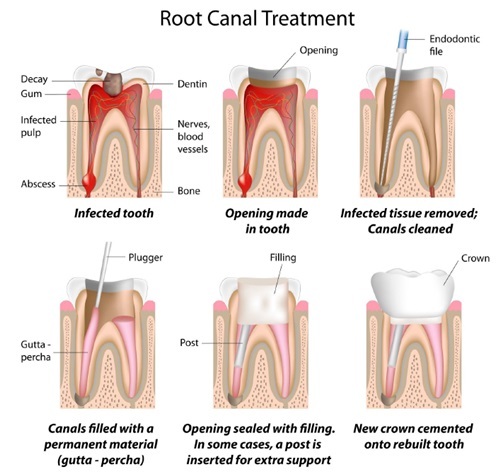 You need not worry if your dentist or endodontist advise you to go for RCT to treat a damaged or diseased tooth,millions of teeth are treated this way each year: relieving pain and making teeth healthy again. In addition, an injury to a tooth may cause pulp damage even if the tooth has no visible chips or cracks. If pulp inflammation or infection is left untreated, it can cause pain or lead to an swelling and pus discharge from the affected tooth. RCT is an alternative to a tooth extraction(removal) and can be a very effective way to eliminate tooth pain and make the tooth functionally and aesthetically viable. With the advancements in technology, equipments and materials in dentistry. RCT can be finished in single appointment in most cases,in some exceptional cases RCT can take two or more appointments depending on condition of your tooth and your personal circumstances, RCT is relatively painless and extremely effective. You'll be back to smiling, chewing with ease in no time. It's very similar to your routine dental fillings. Our Clinic is equipped with latest advancements in dentistry to make each appointment as comfortable as possible for you because we strongly believe in practicing gentle minimal invasive dentistry.